Last week, Belfast City Council voted to flag the Union Jack only on designated days, sparking protest. What does this say about Northern Ireland today, and does it tally with the recent census results? There is a very simple moral reason why the violent protests against the regulated flying of the Union flag at Belfast City Hall should be condemned. Freedom of expression and association depend on respect for the democratic process, the rule of law and the human rights of others. These universal norms have been defied by the campaign of intimidation in recent days. But there is another, factual, reason. This is a conflict of 'generals fighting the last war' - including some actual paramilitary figures. The 2011 census results, just out, show a reduced gap between the proportion of Protestants and Catholic residents in Northern Ireland. In the country’s chronically mistrustful political culture, some may think this an additional reason to be fearful. They should calm down. There is no good public-policy reason for this. The existing declarations required of job applicants have brought employment discrimination almost to vanishing point and, otherwise, public services should be allocated on patterns of social need, regardless of religious affiliation. It is contrary to the spirit of the 1995 Council of Europe Framework Convention for the Protection of National Minorities, which stipulates that persons belonging to minority communities should not be discriminated against, whether they choose to be associated with that community or not. The convention also mandates that states, including the UK and Ireland, promote ‘intercultural dialogue’. Some might argue that we need a tally of how many Protestants and Catholics there ‘really’ are because of its implications for any future border poll, as enabled by the Belfast agreement of 1998. Yet the poll idea only originated in 1973, because the then Northern Ireland secretary, William Whitelaw, had been politically embarrassed by revelations of his private talks with IRA leaders—including Gerry Adams and Martin McGuinness—the previous year, and Whitelaw felt he needed to buy off hostility from the Ulster Defence Association. The poll, massively boycotted by Catholics (and this atheist), was not rerun in 1983 or 1993 as envisaged, because of its polarising effect. Yet the idea reappeared in the agreement, with the condition that it would only be pursued if the secretary of state deemed a ‘yes’ to unification likely. The whole point of the agreement, however, was to transcend the old, either-or, British-Irish national-identity choice, which seemed the only option in 1921 but makes little sense in today’s cosmopolitan and globalised world. By allowing an egalitarian form of devolution—albeit with structures ill-designed to foster genuine power-sharing—the agreement defined a third constitutional option, which is far more popular than the polar alternatives. Despite the widely-recognised poor performance of the Stormont executive, the 2010 Northern Ireland Life and Times Survey found that 58 per cent said the best future for the region was devolved government, as against 15 per cent for direct rule and 16 for Irish unification. This makes the argument over a border poll—and, by extension, the flag at City Hall—meaningless. So could we have a Scottish- or Welsh-style autonomous symbol, please? There will always be only a minority in Northern Ireland who will define their identity as ‘Northern Irish’ (21 per cent, according to the census), since we do not inhabit an independent state. So rather than, as in 2011, asking individuals whether they are British/Irish/Northern Irish, far better in the 2021 census to ask a variant of the national identity question developed for multi-national Spain’s complex tapestry by the academic Luis Moreno. This asks survey respondents if they think themselves as Spanish only, more Spanish than X (say, Catalan), equally Spanish and X, less Spanish than X or only X. 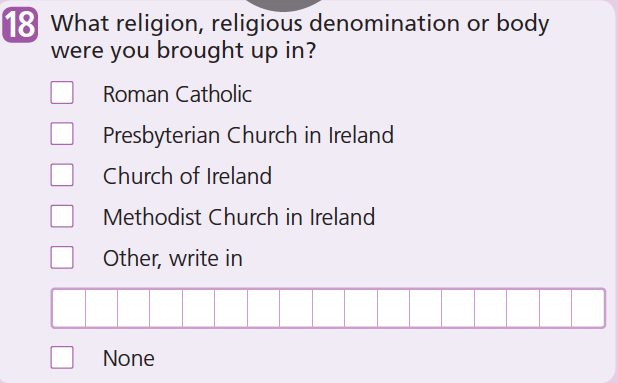 The adapted Moreno question was once asked (in 2008) in the Northern Ireland Life and Times Survey, with British and Irish exclusive identities or combinations defining the five potential answers. It found that 58 per cent (again) of respondents saw themselves as some mixture of British and Irish (more, less or equal), rather than only one or the other. And so 45 per cent also answered ‘neither’ to the recurrent question as to whether they were ‘unionist’ (34 per cent) or ‘nationalist’ (20 per cent). The ‘neither’ – in other words, two fingers to the old political system – rose to two thirds of the ‘post-troubles’ generation of under 24s. In 1985, ‘loyalists’ mobilised (equally fruitlessly) against the Anglo-Irish Agreement. Seeing the slogan ‘Ulster says no’ on a wall in Belfast, one smart graffiti writer added underneath a still appropriate rejoinder—a reference to a contemporary pop song by Frankie Goes to Hollywood—‘… but Frankie say relax’.